Here’s a simple how-to for making kale chips. One of the trendiest and most popular things to do with kale is to transform it into crispy chips for snacking. Though I’m more partial to raw kale salad, kale chips enthusiasts report that once these are out of the oven, they’re instantly devoured by snackers of all ages. Recipes are all over the place as far as oven temperature. Some are as low as 250º F, while others go for the quick-bake, temperature of 400º F. Most fall in the middle, between 300º F and 350º F. I experimented with this quite a bit and found the midrange to work best. Because ovens are often somewhat inaccurate, you might need to experiment to see what works best for you. I happen to like 325º F. Curly green kale works best for the crisp-crunchy mouth feel, though you can use lacinato kale as well. Vary the recipe by using sturdy collard greens as well. Adapted from Wild About Greens. Here’s a simple formula for how to for make kale chips. 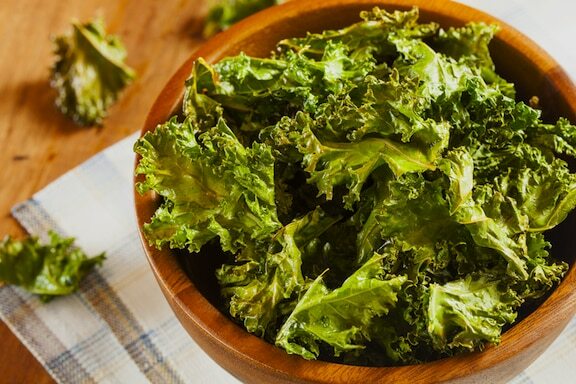 One of the trendiest and most popular things to do with kale is to transform it into crispy chips for snacking. Remove kale leaves from the stems and tear into bite-sized pieces—kind of like large potato chips. If using collards, cut the leaves away from the stems and use kitchen shears to cut the leaves into approximately 2-inch squares or strips. Rinse the torn or cut leaves, and—this is extremely important—let it dry completely. Damp kale will make for soggy chips that don’t bake evenly (I learned this the hard way). Use a salad spinner, or spread on kitchen towels and let it dry as long as need be. Once the kale or collards are dry, preheat the oven to the desired temperature (as mentioned, 325º F. works best for me, but experiment and see what works best in your oven.). Transfer kale or collards to a bowl and drizzle in a little olive oil. Massage it evenly into the leaves with your hands. If you’d like, you can add a tiny bit of red or white wine vinegar or apple cider vinegar and seasonings at this point. See suggestions below recipe box. Spread the leaves on one or two parchment-lined baking pans, in a single layer. Bake for 12 to 20 minutes, depending on your oven’s true temperature. Check them from time to time. The chips should be evenly dry and crisp and just barely beginning to brown. Remove from the oven and let cool until they can be handled. Carefully transfer to a serving bowl. At this point you can sprinkle in a little salt, but you may not need or want to if you’ve added other tasty seasonings. Flavor variations: Some to consider using are chili powder, cumin, smoked paprika, cajun seasoning, or salt-free all purpose seasoning. Don’t use salt at this point, as doing so can make the chips soggy. A delicious flavoring is nutritional yeast which is so compatible with these chips (and makes them a great source of calcium as well as vitamin B-12, so valuable to vegans!). Collard greens variation: Remove the stems from the collard greens and cut into roughly 2- to 3-inch pieces. Follow the instructions above. Enjoy more of VegKitchen’s Snacks and Dips. This is so easy to make and the results are always superb. This year I’ve been using Seaweed Kale from my garden and the structure of the leaves is very attractive although they are being devoured too quickly to be admired. If you have a dehydrater you can get very good results by drying the kale at 70c for eight hours. Thanks, Mark — you’re right, kale chips do turn out very well in the dehydrator, more evenly than from the oven. I have never heard of Seaweed Kale and am curious if that’s something like lacinato. I just made a batch of these and followed this recipe to a T. They turned out great…nice and crisp, I put a bit of cajun-chipotle rub on top, sprinkled and a pinch of sea salt. Delish..even my kids loved em. Fantastic, Scott. Great idea to spice them up with the cajun-chipotle rub! Yum — must try that. Thanks for the nice idea. Once I tried, which was similar to this recipe, but they were bit bitter in taste. Any suggestions please. Everyone’s comments are so eloquent…I’m going to give a simple response.